Greetings again from the darkness. Two people telling the same story can make that story sound infinitely different. Two people united in their efforts to solve a mystery can have vastly different reactions to the same situations. Such personality and attitudinal differences are the real core of this story … even more than the true life inspired story of a quest to reunite a mother and child after 50 years. Peter Mullan’s startling 2002 film The Magdalene Sisters provided us a look into the dark side of Ireland convents in the 1950’s. Here, director Stephen Frears brings us the very personal story of Philomena Lee – one of the unwed teenagers banished to the convent to deliver her baby and work off her debt to the nuns and church, after signing away all future access to her child. It’s a heart-breaking story of the times, of the church, and of a singular woman. Philomena struggles with guilt and regret over 50 years until her daughter arranges a meeting with journalist Martin Sixsmith. This begins their journey to uncover the truth and find Philomena’s son, and provide us with a front row to two distinct ways of viewing the world. 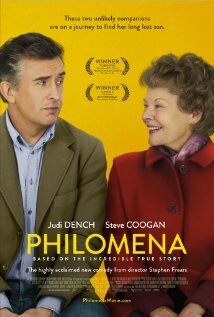 Dame Judi Dench plays Philomena and Steve Coogan (also co-writer and producer) plays Martin, resulting in a very “odd couple” road trip and personality test. Dench is remarkable is her role (surely in the running for an Oscar nom) as the seemingly simple woman who reads romance novels, gets excited about salad bars, is thrilled with mints on her pillow, and has lived a lifetime with a hole in her heart created by having her young son ripped from her world. Coogan is effectively restrained (minus his usual exaggerated comic mannerisms) as the snooty Brit journalist who thinks writing and reading human interest stories are a waste of time. She has maintained her religious faith and faith in people, while he has long ago given up on God and flaunts his cynicism in most every situation. Director Frears has a widely varied movie career – from The Grifters to High Fidelity to The Queen. He excels in drama with a wry sense of humor. 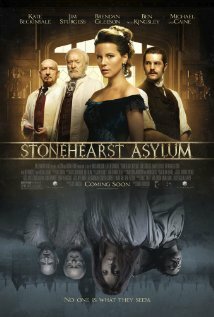 Some will view the movie as anti-Catholic (replete with cruel nuns) … it is difficult to defend the painful childbirth, isolated mothers, selling of children and lack of assistance in reconciling the parties. Others will view this as a victory of faith over intellect. It’s the world-weary journalist with the $5.00 words who ends up learning a life lesson. It can be a reminder that life is going to throw some difficult situations your way. Your attitude and approach that will determine how you deal with it … and how much emotional pain follows. This is another entry into gray cinema that will generate much debate and discussion … a sure sign of success for a movie! SKIP THIS MOVIE IF: stories inspired by real life heart-break is not your idea of holiday entertainment, no matter how thought-provoking or well-acted.